DINO KNIGHTS is a high adventure novel about a group of young knights riding into adventure…on the backs of dinosaurs. 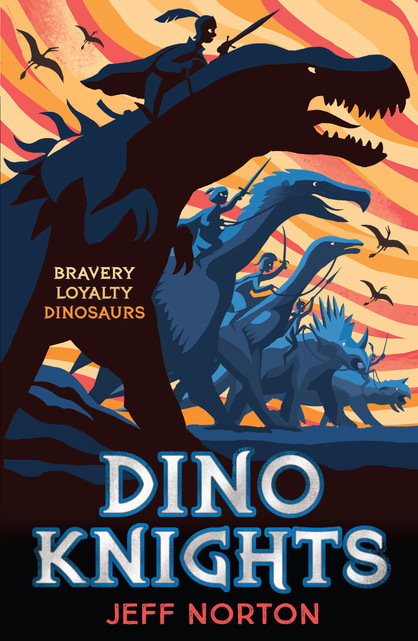 DINO KNIGTHS publishes in paperback on June 6th, 2019. Imagine a parallel medieval times as if the dinosaurs never died out. Feudal Lords battle to control the land. In this fusion of Camelot and Cretaceous, five young knights bravely defend their realm by riding into adventure on the backs of… dinosaurs. Our world is Panterra, a super-continent that looks and feels like medieval Europe…but with domesticated dinosaurs (and some wild ones!) instead of horses. The book is available to here. DINO KNIGHTS is being adapted for television by OmniFilm Entertainment and The Jim Henson Company. Show-runner Simon Barry is executive producing alongside Halle Stanford, Jamie Piekarz, Brian Hamilton, Paula de Oliveira, Lisa Henson, Zach Lipovsky, and author Jeff Norton. You can read the TV announcement in The Hollywood Reporter.